Before arriving at the Samsung Innovation Museum, I had an idea of what to expect: the Korean company shoehorning itself into every technological milestone, whether it deserved to or not. Fortunately, that wasn’t completely the case — and there’s even an Apple product inside. The five-storey complex in Suwon’s Digital City (that’s the nerve center of Samsung Electronics) starts with the advent of electricity and goes from there. Any notion that this is a Samsung… thing is only really apparent when the timeline covers the company starting to build electronics itself — oh and a big helping of those see-thrutouchscreen displays boxes… yeah, they were a hint. The museum opens to the public today, but we took an (admittedly on-the-rails) tour with other foreign media last week. Is it worth a trip to Korea? Maybe not, but if you’re a tech obsessive already visiting Seoul, it could be worth the trip out to Samsung’s Digital City. Be warned: it was mildly educational. Samsung Electronic’s CEO said it will give the public a chance “to see where we’ve come from” — and that’s exactly what the first floor’s dedicated. The museum is undeniably stylish (and it helps that it’s brand new), but what I liked the most was the realia; the for-real artifacts from history. Not just a StarTAC and the first slimline TV, but an Edison filament lightbulb, the first ever TV. The Samsung Innovation Museum (SIM: see what they did there?) gets a credibility boost from these merely being here. The whole museum has similar style lines to Samsung’s pop-up stores and even event booths at the likes of CES and MWC: all curved corners and cutaways. 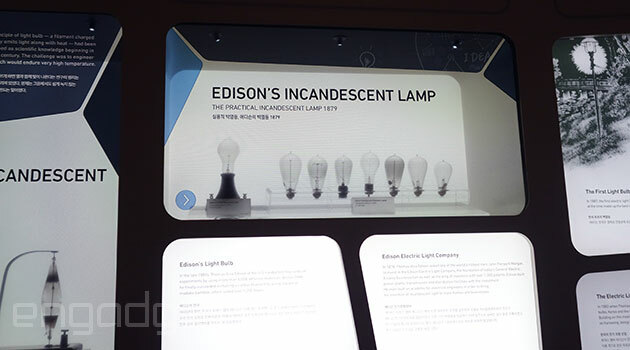 Standalone stations that guide visitors through the floors have a trigger inside, from a power switch, to morse code tapper to a radio dial, and these initiate a quick video, projected onto the walls. It’s all very institutional-styled, but I was surprised at how much detail some of the displays went into. This isn’t just a Samsung showcase, and I’m sure the company has knowingly skewed the content to pull in school trips, but there’s a lot more to absorb here than at the company’s showcase store in the middle of Seoul. Moving up to the next floor, the tour takes a heavier Samsung bent. This level is meant to represent the present, and well, recent past, covering the advent of TV sets, phones, smartphones, the internet — the things that made Samsung Electronics the multinational giant it is today. It also attempts to outline the lifestyle and sociological changes that have accompanied the expansion of electronics. The early stages and stations focused on the inventors, the museum tries to elaborate on the role played by corporations in expanding and realizing these ideas — without the production scale of big business, the narrative says that large-scale roll-out of technologies (and more importantly, products) would have been impossible. Thanks corporations! The final floor is an out-and-out Samsung promotion, although there are some interesting things (military-styled Galaxy S4 anyone? ), alongside the chance to test out its latest releases — at this point there’s several tables of Gear 2s and Gear Fits to mess with. There’s also areas to show off contactless payments, point-of-sale displays and more. It’s called the B2B zone and felt a lot like a deserted trade show booth… all the gadgets but none of the crowd crush. Further down, there’s also a curved UHD theater, but for the moment, it’s another cheery showcase of Samsung Electronics and another little presentation trick that we won’t spoil for anyone that makes the trip to SIM. The content here’s a bit insipid, but hopefully the company might host some awesome 4K content in the near-future, maybe when there’s more 4K content out there. It wouldn’t be a museum without a gift shop, either, and several product ranges here including charitable donations. Unfortunately, there’s some Chelsea Football Club merchandize too, but I won’t hold it against them. Samsung’s museum is another effort to improve its image, not that it was necessarily a bad one to begin with — and it really wants to be called innovative. I think I’d have preferred it titled the Innovation Museum, but then, why wouldn’t you put your company’s name in there, right? The phone segment, in particular, while dodging recent innovation issues, touches on many firsts. The first phone with a TFT-LCD display? A Samsung. The first MP3-playing phone? That’ll be another Samsung. There’s an unmistakeable Samsung tinge to everything, but I imagined this was going to be far more obvious and cloying.The exhibit, while skipping over a lot of Apple and (native rival) LG products, makes room for the likes of the StarTAC, the Apple II PC (gasp!) and the before-its-time Simon Personal Computer — grown-up moves that better help to illustrate the blazing fast progress of technology and electronics. 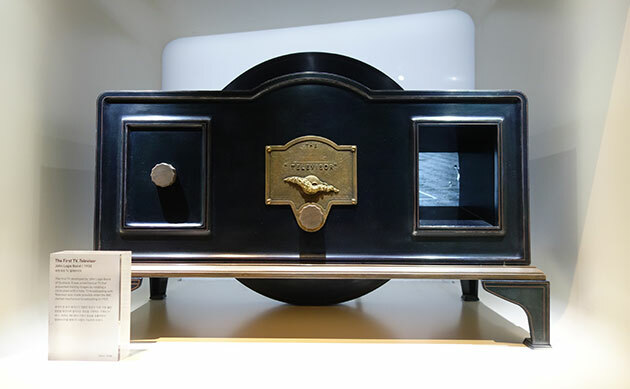 But as a museum, perhaps nothing demonstrates the industry’s pace better than the semiconductor section (an arm of Samsung that forms the backbone of the company and its profits), with a side-by-side look at the first, huge, transistor and its contemporary ancestor — a fraction of the size and several times more capable. 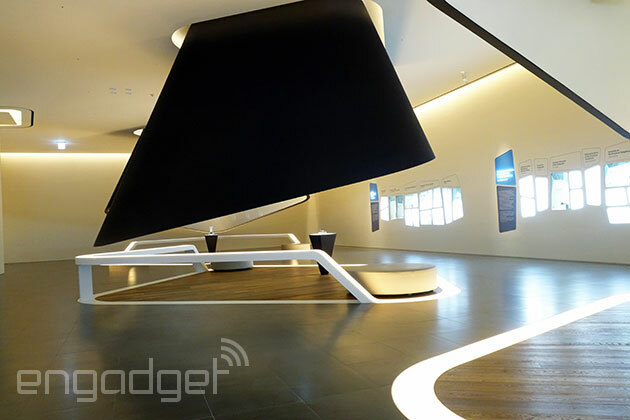 Based in Suwon, Samsung’s Innovation Museum is open from 10 am to 6 pm, Monday to Saturday. Visitors on weekdays have to make an appointment in advance atsamsunginnovationmuseum.com, but weekend visits can be done without reservation. reported anything from error messages to being unable to access apps on their smart TVs. Reports have spread on Twitter — mostly from a community news site called Wikitree — that a fire at a Samsung SDS building in Gwacheon, South Korea is the culprit. We’ve contacted Samsung but haven’t heard anything back yet, and while some of its social media pages have noted the outage, there isn’t an official explanation posted. Update: Naturally now that we’ve mentioned it, the outage that lasted several hours appears to have ended around 6:15AM ET. Many of the same users who were having problems with their smart TVs and phones seem to have full access again, andSamsung.com is back up and running. A Samsung SDS blog post confirms the fire and subsequent outage, while apologizing for the inconvenience. Despite some scary photos and video of the blaze (after the break) Korean news reports indicate there were no fatalities. The big question left? Why a fire at one location seemed to have such a large affect on the company’s devices and services. Four days after Samsung released its long-awaited Galaxy S5, security researchers say they’ve already found a way to hack the smartphone’s fingerprint sensor. In a video posted Tuesday on YouTube, experts from Security Research Labs demonstrated an apparent breach of the S5 using similar tactics employed late last year to bypass the fingerprint lock on Apple’s (AAPL, Fortune 500) iPhone 5s. The group says it used a camera-phone photo of a fingerprint on a smartphone screen to create a “fake finger” sheet out of a wood-glue mold. That allowed them to access the S5’s home screen and even send money via the PayPal app, which uses fingerprint authentication. 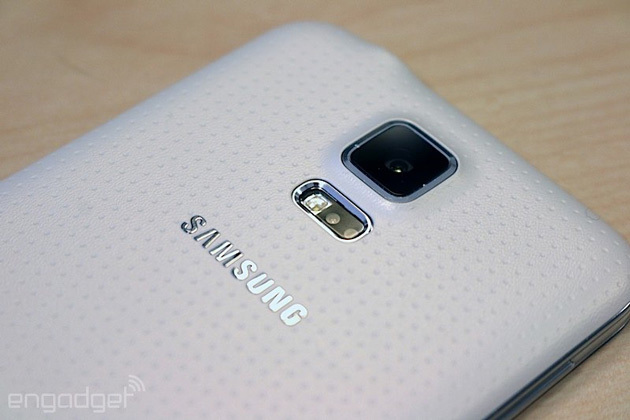 “Samsung does not seem to have learned from what others have done less poorly,” Security Research Labs said. Samsung (SSNLF) did not immediately respond to a request for comment. The company says it can quickly deactivate fingerprint keys on lost or stolen devices, and that users are covered in case of fraud by its purchase protection policy.